Uncooperative weather in Oyster Bay leaves round robin incomplete after two days of racing and team anxious to get races off in the Grand Slam Series’ finale event. 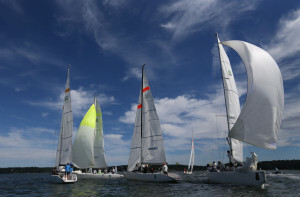 Oyster Bay, New York – Damage to boats, including the RC boat, on day one warranted a seriously tough reality check from the organizing authority on day two. 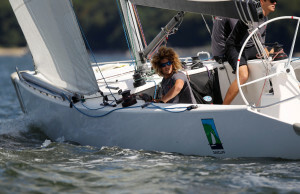 Sailors were explicitly reminded of the OA’s option to excuse unsportsmanlike teams from the event and exercise rule 69. After seeing a handful of penalties early in the day, Stratis Andreadis (GRE) earned the first black flag of the event as Mark Lees (GBR) successful lured him into three penalties (not entering and two contact-less, give-way situations) during the prestart. An unseasonably chilly morning brought in a fresh 9 knots that allowed race committee to coast through three flights, but the sun arriving midday slowed the pace considerably. Huge pressure differentials across the course made for big separation on the racecourse and fewer options for trailing boats. Dustin Durant (USA) used the patchy conditions to serve David Gilmour (AUS) his second loss in Gilmour’s last race of the round robin. The four teams passing straight through to quarterfinals, already decided despite being three races shy of a complete first stage, are Chris Poole (USA) with Riptide Racing, Nicolai Sehested (DEN) with TRE-FOR Match Racing, David Gilmour (AUS) with Team Gilmour, and Eric Monnin (SUI) with Okalys Corum Sailing Team. All other teams will advance to the repechage’s first to three knockout series to determine the last four teams who will sail in the quarterfinals.